Dr. Chuck Hughes has been in the specialty practice of pediatric dentistry since 1989. He is a graduate of the University of Tennessee School of Dentistry where he was awarded the American Society of Dentistry for Children's - "Student of the Year". He then went on to complete a 2 year pediatric dentistry residency and masters program, also at the University of Tennessee School of Dentistry. Dr. Hughes has excelled in his specialty and is an active member of many professional organizations including the American Academy of Pediatric Dentistry, the American Dental Association, and the Tennessee Dental Association. Dr. Hughes is dedicated to providing all of his patients with the most comprehensive and advanced pediatric dental care available. During his residency, Dr. Hughes received extensive training in hospital dentistry for children at prestigious hospitals such as LeBonheur Children's Hospital and St. Jude's Children's Research Hospital. He is able to provide comprehensive dental treatment with the use of general anesthesia in a hospital setting for children with severe dental problems as well as emotionally and physically challenged patients. In addition in each of the last 2 years, Dr. Hughes has completed over 100 hours of continuing education in full-face orthodontics and other aspects of pediatric dentistry. Because of his unique pediatric dental training Dr. Hughes makes It possible for children from West Tennessee, Arkansas, Missouri and Kentucky to achieve a healthy smile and maintain a positive outlook of dentistry for a continued future of good oral health. Dr. Hughes avidly enjoys hunting and fishing with his family. He also enjoys cutting grass on his tractor. He plays softball and coaches his little league baseball team, "Dr. Hughes' Mighty Molars". Dr. Hughes is married to Marla Hughes, who also works at the office as Chief Financial Officer. The have been happily married for 12 years and have five children, Courtney, Chris, Cameron, Olivia, and Charlie. Dr. Susan Huffstetler Cox joined Dyersburg Pediatric Dentistry in 2002. A native of Union City, Tennessee, Dr. Cox has received degrees from Vanderbilt University and the University of Kentucky College of Dentistry. A great love for working with children led her to complete a two year specialty residency in Pediatric Dentistry at the University of Tennessee in Memphis. Included in her training was providing surgical and emergency services at LeBonheur Children’s Hospital and St. Jude’s Children’s Hospital. She is an active member of the American Academy of Pediatric Dentistry, the American Dental Association, and the Tennessee Dental Association. Dr. Cox is married to Wade, who is a United Methodist Pastor. They have two wonderful children, Davis and Brooke, who keep them very busy! Dr. Cox loves being a part of Dyersburg Pediatric Dentistry, where we strive to provide the most excellent care for children in a positive and fun environment. She looks forward to meeting you! Dr. Jodi Braid is a recent graduate of the Pediatric Dentistry program at the University of Missouri-Kansas City. During her residency, she spent her time treating children from all walks of life at Children's Mercy Hospital, one of Child Magazine's top ten hospitals. Although she has also earned degrees from the University of Illinois-Urbana Champaign and Southern Illinois University School of Medicine, Dr. Braid considers herself a life-long student of pediatric dentistry and is always striving to improve her skills and knowledge in order to serve you better. Dr. Braid always knew that if she were to be a dentist that she would be a children's dentist. She loves working with kids. Their honesty and curiosity can prompt them to say some pretty silly things and that makes for a fun day at work. Dr. Braid considers it a true honor and privilege to have the opportunity to help improve the oral health of your children. Dr. Braid and her husband, Bryan, were excited about relocating to Dyersburg in 2004 with their son, Billy, and their two labs, Handsome and Russell. They felt as though Dyersburg offered a great place for them to enjoy the outdoors, hunting and taking long walks. The Braid family was anxious to become involved in such a beautiful and friendly community. Dr. Braid is delighted that you have brought your child to Dyersburg Pediatric Dentistry to meet this wonderful group of people. Although she had interviewed many places, she chose to come here because Dr. Hughes, Dr. Cox, and their staff truly care about helping children. Dr Jason was born December 30, 1979 in Memphis, Tennessee. He attended Evangelical Christian School where he was an all-state baseball player and an all-metro football player. He graduated high school in 1998. He attended Samford University in Birmingham where he received his degree in Mathematics in 2002. He taught geometry and coached football for one year at Cordova High School before starting dental school. In 2003, Dr. Jason attended the University of Tennessee. He graduated from dental school in May of 2007. In 2002 Dr. Jason married his high school sweetheart, Stacey. Stacey is a 3rd grade teacher at Germantown Elementary. In October of 2003 they had a son, Tucker. Tucker loves music, Thomas the train, and playing outside. In April of 2007, they had their second child, a daughter they named Collier. Dr. Jason enjoys sports, especially ‘Ole Miss. He enjoys reading novels, watching movies, running, and playing flag football. 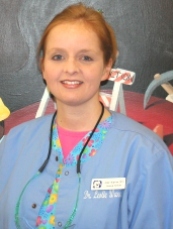 Dr. Leslie Warren joined Dyersburg Pediatric Dentistry in August 2006. She was born and raised in Dyer County and graduated from Dyer County High School in 1994. Dr. Warren earned her Bachelor of Science degree from the University of Tennessee at Martin in 1998 and went on to receive her Doctor of Dental Surgery Degree form University of Tennessee of Memphis in June 2001. Dr. Warren has spent the last five years practicing family dentistry serving the people of the Crow Indian Reservation in Montana. While serving in Montana she became a member of the American Dental Association as well as the American Association of Women Dentists. During the last five years Dr. Warren had the opportunity to serve people of all ages, but it has been the children that she enjoyed most. She is excited to bring her knowledge of family dentistry to the children of Dyersburg Pediatric Dentistry. Dr. Warren and her husband Chip are thrilled to be returning to the West Tennessee area. They have 2 children. Together they enjoy the outdoors, especially camping and fishing, and spending time with their extended family. Dr. Warren is excited to offer her services to you and the children of Dyersburg Pediatric Dentistry and she is looking forward to meeting you. Click here to read our Disclaimer. Privacy Policies.